Those are the words Head Coach Jim McAdam said to his varsity team during a meeting before the start of the 1988-1989 hockey season, and he was right. By the end of the season, his team had surprised all the critics, stunned several rivals, and brought home Austin Prep’s second hockey state championship. 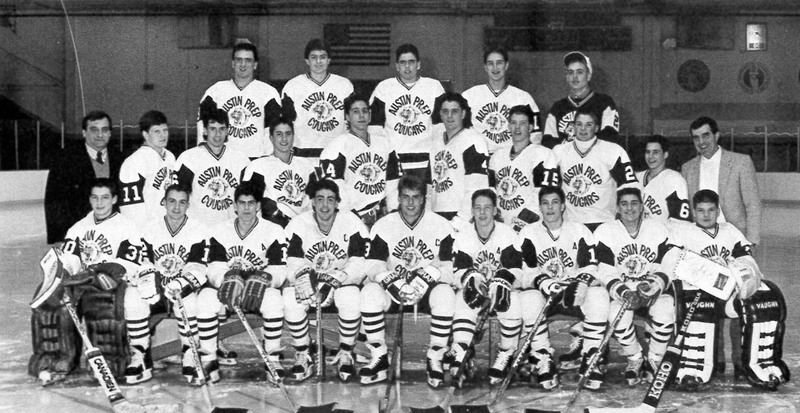 The team’s story begins before winter 1988, as a group of talented ninth-graders became the freshman hockey team coached by McAdam. When McAdam accepted the varsity head coaching job the next year, he brought those students with him, and continued to add talented underclassmen in the ensuing years. By the 1988-1989 season, the team was not only very skilled on the ice, but very much a family off the ice. With a team-first mentality, every game was hard-fought, and Austin Prep finished the season with a 21-4-1 record in the Catholic Central League. After losing to two-time defending state champion Matignon twice during the regular season, the Cougars beat their rival in the state semifinals, prompting McAdam to tell reporters, “It’s better than winning a million dollars!” From there, the team never looked back, clinching the Eastern Massachusetts Championship over Acton-Boxborough 3-2 – which was “better than winning two million dollars” according to the head coach – and holding the Division II State Championship trophy on the Boston Garden ice after defeating Springfield Cathedral 8-3. In the accolades that followed, the CCL named Steve Ervin ’89, Chris Scourletis ’89, and Dave Pasquale ’89 as All-Stars; and the Boston Globe named Ervin and Scourletis as All-Scholastics, selecting Ervin as Player of the Year and McAdam as Coach of the Year. Freshman goalie Dave Daddario ’92 was well on his way to earning his 39 career wins – the second most in Austin Prep men’s ice hockey history.